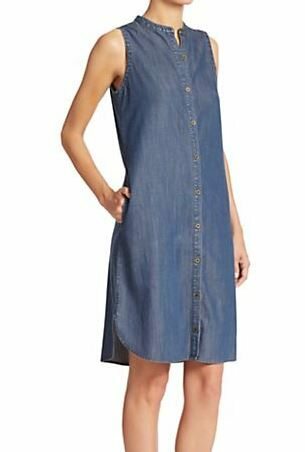 As an alternative to jeans, consider a denim dress. It’s certainly cooler, and more professional . . . . on the Casual Friday continuum. The dip-dyed (actually, dip-bleached) skirt of this dress adds interest and, dare I say, a little edge? The skirt was originally very full; I had the sides taken in a little to reduce the volume. When the tailor (Fatima’s business partner) made this alteration, he had to undo and then re-sew sections of the hem. He was careful to use the same type of thread and stitch that the manufacturer had used. It was a little bit of a challenge because the original hem was top stitched with long stitches and a heavy gauge thread (closer to embroidery floss than thread), but he contrived! When altering clothes, replicating the original stitching is important, so it’s always a good idea to chat with your tailor and make sure that both of you are noting and agreeing about the details. I don’t know about you, but I am very afraid of white shoes — and hadn’t worn a pair in decades, until I bought these sandals last summer. They are a creamy, vanilla white and the leather is glossy (not patent, but not calf-skin either). The foot-bed looks like brushed aluminum and the sole is black. So the overall effect is graceful and light, but grounded — and not jarring, ultra-white. But back to the denim alternatives! Here are some ideas from this season. I like how you buttoned all the way to the top. It’s demure, yet the bottom of the dress is a bit sassy. If I were to venture into open-toed shoes at work… these are a great choice for summer. 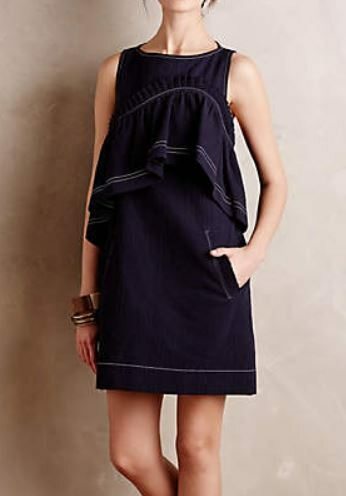 I’m coveting your stunning YMC dress … which is not available anymore. Amazing on you. Styled to perfection. 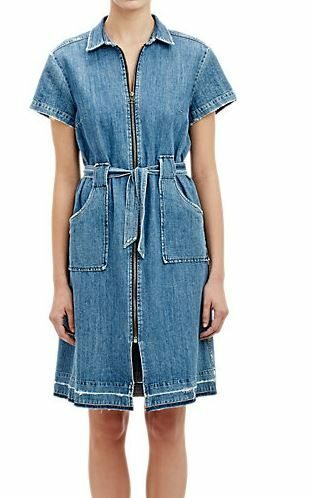 Most denim dresses are too dull, sack-like or too short, but that one is perfection with the sandals. I’d jump at the Karen Walker one, but it’s too short for my liking. Why are all the dresses SO short? Discuss. Yes, discuss! I don’t know why all the dresses are so short, but maybe one of my super-smart readers does. Regardless of why (unless someone tells me that it is actually the linchpin of an emerging environmental/conservation movement), it drives me crazy. 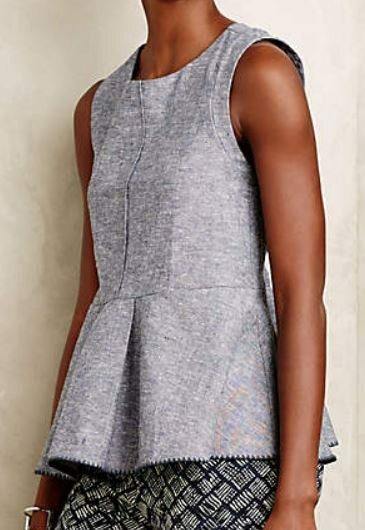 I see lots of super-short dresses that are not suitable for office wear but expensive, and therefore not (at least, I wouldn’t think) accessible to most young women. Could it be that “daughters of Russian oligarchs (ages 18-23)” are a large enough demographic to move the whole market? I will try to learn more and write a post about this. Precisely (the daughter-of-Russian-oligarchs comment made me snort my tea). The women of our vintage who could afford these dresses mostly won’t wear frocks that length. Or maybe some of us do? 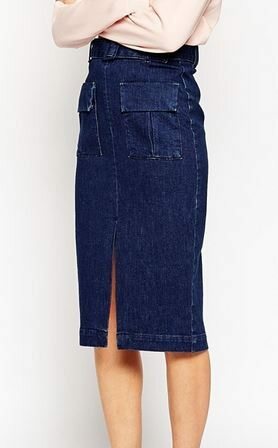 Maybe that’s it – I dislike short skirts, but perhaps more older women are wearing them now?